Humans are born with no vocabulary – the newborns are either silent or they cry. In a few weeks, however, they learn to use their cries and a few other sounds, differently enough, to make them convey hunger, happiness, pleasure, discomfort and pain; and mothers and other caregivers too, learn to distinguish one type of sound from the other. By two months, the babies start using basic sounds like aa, ae, uu. These first sounds are emitted naturally – without the need to teach or learn – because of our genetic predisposition to make sounds (which we also share with other animals and birds). Two to three months following that, they start to babble and then, to talk to themselves with sounds like ma, da, poo, do, na. At this stage, they make all the sounds they will ever need for any language, and more. And that is why; any child can pick up any language (including the accent) if she is exposed to it at an early enough age. These first sounds that human babies make (when they are well fed, cleaned and clothed) have no motive or purpose per se. They are emitted because the sounds of their own voice makes them curious and happy. So the first words usually are those which involve ‘repeated sounds’ — mamma, daadaa, booboo and so on. Though most are meaningless to us, it’s crucial in their learning to speak – for now they are entering the stage of imitative learning. It generally starts with the adults imitating the baby’s sounds (talking to them in their language) and the baby responds to it, as his or her own voice. Then the role is switched and the parent now introduces new words which the baby imitates. Gradually, she learns to start relating sounds to things. As when the mother says ‘ball’ while holding it up for her, the child learns that the thing in the mother’s hand is ball. (Of course, she would need more than one reiteration before she sees the connection between the sound b-a-l and the object ball). Or when the father comes in and she says Papa, the child learns that this big guy who keeps lifting her up in the air is Papa. Thus she builds her initial vocabulary. The next big step in the development of speech (and thought) comes when she learns to use words for concepts. A child, when she learns a new word initially, understands it as a name for a particular thing (a proper noun). So ‘ball’ is only ‘that ball’ which her mother has shown her. Based on her experiences and what she hears from people around her, she later learns to call any round object that bounces and she can play with — big or small, red or black, soft or hard – a ball. This might sound insignificant — but the ability of our species to give names to and hold abstract ideas is important because it plays a crucial role in the development of thought. Without the ability for abstraction, the world is limited to individual objects or experiences, the canvass extremely small and jumbled up. For example it’s only when one can conceive of ‘humanity’ as a class and as distinct from ‘a human’ that we can expect him to conceive of the concept of say ‘universal brotherhood’ (striving for it can come only much later). This ability to abstract and share these abstractions made possible the mental development of our race at an unprecedented rate, opening up new avenues of social-learning and possibilities – and making us (homo) sapient. 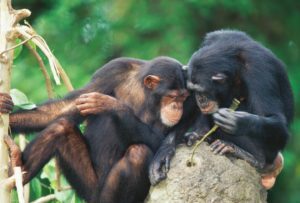 Hominids’ (human ancestors) first attempts at language, too, were perhaps not very different from those of a babbling child or some of the animals in our zoos. Cries, howls, incessant chatters — much of it would have made little sense, even to the hominids themselves. Which is not surprising, considering they were not always generated to convey something, but because the sound pleased the person who emitted them. They did know its use in warning each other of approaching danger or to convey some basic emotions — anger, pleasure, pain, threat etc. but their earliest vocabularies were limited to gesticulations, grunts and howls. In time, however, the need for cooperation and therefore communication grew. They likely discovered the potential and usefulness of simple grunts, if they could control them better. Now they could whisper to their neighbors even while hiding in ambush and did not have to create a ruckus or use the cumbersome sign language which needed them to let go of their weapons just to tell the other guys that it was a bison which was approaching their trap and not an elephant, but the game was still on! Our guess (for we have no written records) is that the first ‘words’ were interjections (similar to Ahs! and Ohs!) Then came the demonstrative words which accompany gestures, (for e.g. this, that, those, here, there) and words which were imitative of nature (for e.g. coo for a pigeon’s cooing). The recreated sounds were perhaps subsequently used as names of the actions, event or objects which they imitated. For instance ‘quack’ for a duck or cucu for a cuckoo. We still use some such words in our languages. For instance, in English we use swoosh (a sudden rush of fluid), hiss (of a snake), hum (from the habit of saying humm when in doubt and which has also given us our phrase ‘hum and haw’ .i.e. to hesitate). In Hindi we use such words as phat (imitating a blast or a strike), memiana (bleat of a goat, denoting a low or pleading voice) and khikhiana (imitative of giggling). Some such words, because of their nature, are used in multiple languages. Russian for giggle is khikhikat and murmur of English (to say or complain in low tones) is murmur in Hindi, marmara (rustle) in Sanskrit, mormurein in Greek and murmurare in Latin. Perhaps the imitative origin of words can find no better example than haitschu, a word used to denote sneezing by an ancient tribe of Brazil. From these simple beginnings – an assortment of slightly distinct grunts and words imitating nature, it is believed, arose our first set of root-words. Perhaps no more than a few hundred each, they formed the vocabularies of humankind’s languages. While this made the language more precise and detailed for some, it also made necessary the existence of some ‘guidelines’ without which it would become impossible for one person or group to understand the other/s and the advantage of language as a tool for communication and cooperation would be lost. And with that necessity came the first ‘rules’ of language – what a certain word would mean and what it would not mean, how a verb can be used or not be used. These rules were the precursor of our language semantics and grammars. Of course, not all the directions could be expected to be logical and the rules to be error free, as the students of English grammar would attest, but they were most likely made by the elders of the tribe or someone who was believed to be knowledgeable, so most went along with them. But humankind had just started its journey. It had oceans to cross, mountains to scale and continents to conquer. As the groups spread apart (sometimes forced to do so on account of lack of food or a fight with the cousins and at times voluntarily) in search of better pastures and newer opportunities, they took their languages with them. As the distances and time grew between various tribes, some aspects of the ‘original’ languages were lost and new aspects were added, which were often quite distinct from what the other groups of the same extended family were adding to their ‘branch’ of language. (Pick up any of Shakespeare’s original plays and you cannot help but notice the impact just a few centuries has had on English.) Over thousands of years, some of the ‘sister-languages’ became so distinct from each other that if people from both tribes were to meet again, they would scarcely know what the others were saying. But some languages did retain commonalities despite the vast distances separating them. Today, we place such similar languages in ‘language families’. The awareness of similarities between languages is not new. Quite often groups have as their neighbours people speaking different yet similar languages – for example Bangla (Bengali) is notably similar to Axomiya (Assamese) in the east, Oriya in the south and Maithili to its west. And it’s not uncommon for a native Telugu speaker to ‘guess’ fairly comfortably what his neighbor is telling him in Kannada. This is often assumed to be, and not always mistakenly, because of the physical proximity and long contact between the groups. One of the first studies which looked at comparing languages spoken over a much larger geographical area (and so could not be explained merely on the basis of proximity) was done in the 17th century. Marcus Zuerius van Boxhorn, a Dutch professor, put forward a hypothesis that European languages (such as Greek, Latin, German and Dutch) are similar to Persian (or Farsi – an old Asiatic language) and they all belong to some older mother language. There was not much interest or development in this field for a long time, till comparative linguistics (as the study of relationships between languages came to be known) received a new life with the discovery of the similarities between Greek/Latin and Sanskrit towards late 18th century. William Jones, the man credited with this discovery, came to India in 1783 as a judge appointed to the Supreme Court (Bengal). He had a knack for languages since childhood and had learnt Greek, Latin, Persian, Arabian and some Chinese at an early age. Arriving in India, he discovered a land as yet untouched by western scholars. In 1784 he founded the Asiatic society (for Oriental Research) and being a polyglot he took to learning Sanskrit. 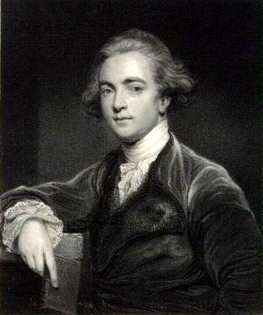 In 1786, in a speech to the Asiatic society which was later published in 1788, he startled the western academic world by declaring Sanskrit to be “more perfect than the Greek, more copious than the Latin, and more exquisitely refined than either, yet bearing to both of them a strong affinity, both in the roots of verbs and forms of grammar, than could possibly have been produced by accident”. He went on to suggest that Celtic, Gothic (see below) and old Persian had the same origin as well. This opened to the western world the mine of Sanskrit literature and the interest in comparative linguists was now so strong (who would have thought people from the western fringes of Europe to the eastern edges of Indian subcontinent were all speaking languages from the same family?) that Jones is at times credited to have launched modern comparative linguistics. 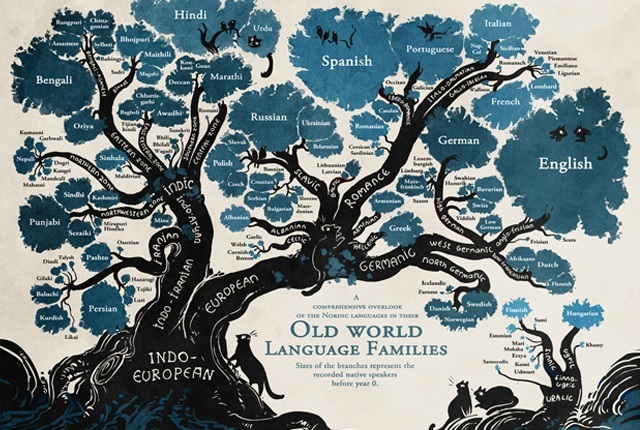 Many languages, both living and dead (for languages, as humans, are born, grown young, become old and die) have now been classified into ‘language families’ – which are essentially groups of languages sharing a common origin. Linguistics, we must note, is a developing field and just as before 1788, relationship between Sanskrit and European languages was not known, it is quite possible that there are other relationships which still lie hidden from us. It also must me noted here, that the rather intuitive tendency of strongly relating people to languages should be avoided – a common origin of language does not necessarily imply a common origin of all people speaking that language today just as groups speaking different languages, in itself, does not prove their different origins. While it can be argued that a significant number of people speaking a common tongue will naturally be related, it must also be taken into account that migrations, marriages, trades, cultural exchanges, wars, religion and similar factors, over many thousands of years, have led to substantial inter-mingling of people. This makes sharp distinctions of people based only on the languages, a very unsound exercise. The 2005 edition of Ethnologue divides the world languages into 94 language families. Out of these 6 are classified as major language families based on the fact that each of these includes at least 5% of the world’s languages. Together they are related to about two thirds of the world’s languages and the languages themselves are spoken by about five- sixths of the world’s population. These include: Indo-European, Sino-Tibetan, Niger-Congo, Afro-Asiatic, Austronesian and Trans-New Guinea. It’s not easy to reconstruct the past based on the often scanty evidences that the tides of time have yet not been able to hide from us. Add to this the personal and social prejudices and the possibility of errors in judgement and it’s not hard to understand why sometimes it takes decades or more for scholars to agree on a certain explanation, hypothesis or theory. 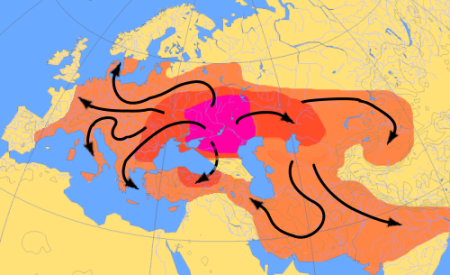 The place of origin, of the Indo-European languages, is one such topic. Most hypotheses (or models as they are called) suggest the Black Sea-Caspian Sea area as the place of origin of the proto-Indo-European language. The Krugan model, arguably the most widely accepted of the list, suggests the steppes (fiat grasslands, usually treeless) that stretch between the norths of Black sea to the east coast of Caspian Sea as the likely place of origin. During the last ice age, following the herds of migrating animals, a large group is supposed to have reached the grassy flat-lands that stretched for miles, in this region. After staying here for thousands of years and communicating in a common language (proto-Indo European), as the ice started melting and people could see lands beyond the flat plains, they started moving in different directions. 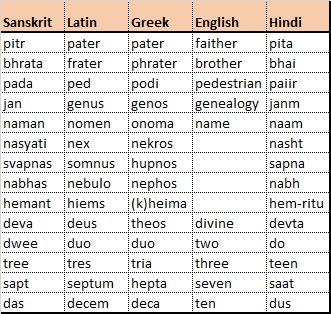 Given below are some words from Sanskrit, Latin and Greek to illustrate the similarities between the languages. It must also be noted that the Indo-Iranian languages branched away from the rest of the group about 2500-3000 BC. Therefore, even if similar roots exist, the derived-words have often taken different pronunciations and meaning and hence the the similarities might not be apparent. “Nabh” is a good example of this. Unless you have studied Sanskrit at school or are proficient in Hindi you might not know what it means. Yet, with a little help, it is not difficult to see the connection. Words, as we saw, were primarily invented for the purpose of communication. Though not essential for thought, they have had a substantial and fortunate impact on our ability to think. Much of the day-to-day thinking we do involves ‘physical’ things. When you think of home you would maybe substitute it for an image of your favorite corner by the window or some other image you have in mind. lf someone were to ask you for direction to the other end of town, you would make an image of (i.e. imagine) the route in your mind before explaining it to him. You don’t essentially need words to have these thoughts. But a lot of thinking that we do involves ‘abstraction’. It involves understanding the common or general characteristics/ features of something and giving it a symbol, even though in reality there is no such physical thing. For e.g. bravery or honesty. So when new words are exchanged or learnt it also introduces new concepts or ideas to the person. Once the idea is understood, the person can now use it to build upon it further. Let’s take for example the words ‘id’, ‘ego’ and ‘superego’. These words were used by Sigmund Freud to describe the structure of the human psyche. (The actual words are in German). He describes id as “instinctive impulses of the individual”. It’s that part of mind which represents our instincts, our natural inclinations, our gut feel’. Similarly ego is “the part which is most conscious of self and gives one a sense of individuality’ and ‘superego’ the ‘agent of self-criticism or censor, influenced by the parental and social control and prohibitions, early on in life”. If you were not familiar with any of the three words described, the description has not just help you add new words to your vocabulary (which you obviously can now use in your interactions with others), it has also introduced new ideas or concepts to you. And if it interests you enough, you will find yourself thinking over these and possibly coming up with new thoughts, questions and conclusions. For e.g. is it possible for ‘id’ to be inherited? Does the id of parents influence the id of their children? If yes, can it be linked to a gene? If no, what influences the features of a person’s id? Or are the features the same for all individuals? If yes, why are some children ‘instinctively’ shyer or more violent than the others? And thinking it over, you might discover or help discover new ways to improve the ‘instinctive behaviour’ of children. Thus, words and languages helped us spread our thoughts, learn from and influence each other and speed up the acquisition of knowledge about our own selves and everything around us.